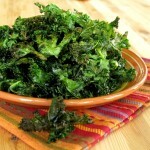 Crispy Kale Chips stand alone as a tasty snack or take a salad to the next level and use them as a crunchy salad topper! 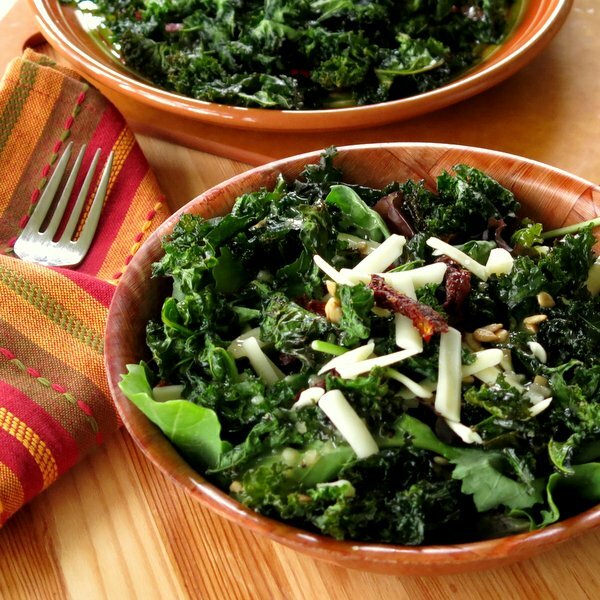 Instead, I’m sharing a great way to jazz up a salad that will turn even the tentative kale chip eater into a fan! This beautiful plate of goodness did not have many takers. Let’s just say my family endured a not-so-good kale chip experience and their opinion was reinforced when we ordered a bitter and bland-tasting batch at a local restaurant. The fate of this trendy chip seemed to be set. I didn’t push my luck. 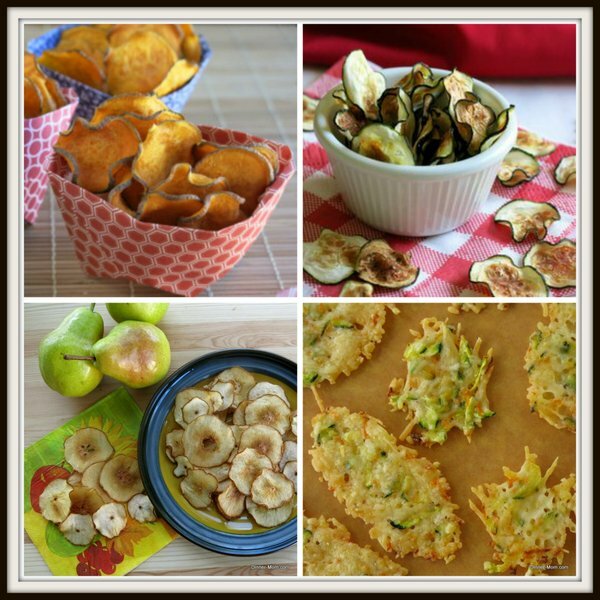 Instead, I made sweet potato chips, zucchini chips and pear chips. I even made Parmesan cheese crisps laced with carrots and zucchini. These were all very well-received. Start with a clean, dry chip. Let them air dry a bit after washing to be sure. Lightly coat each chip with olive oil by “massaging” it so the entire leaf is coated. But, it shouldn’t be dripping with oil! Don’t cook the chips too long! They should be crisp, but not brown on the edges. The result is a crispy kale chip that stands up to the scrutiny of the pickiest of chip eaters! Even so. I decided to re-introduce the chips in a whole new way by using them as a crunchy topper in this salad that also has strips of gouda cheese, sundried tomatoes and sunflower seeds. Delish! Let’s just say, kale chips are now part of the menu rotation at our house! 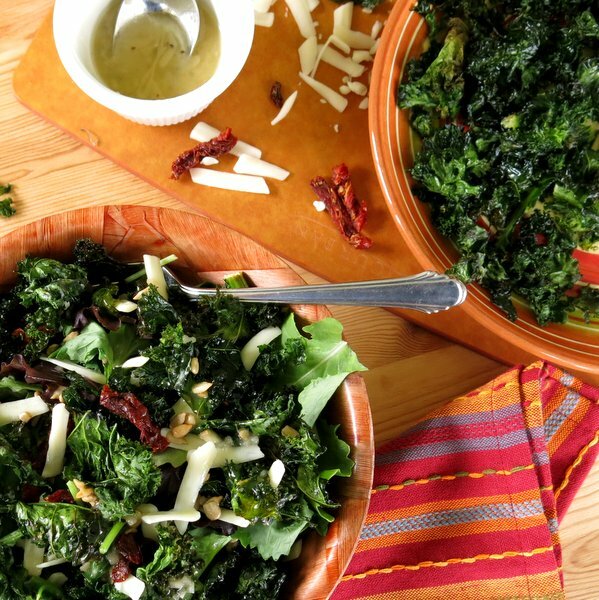 Crispy Kale Chips stand alone as a tasty snack or take a salad to the next level by using them as a crunchy salad topper! Tips for the perfect chip. Tear kale greens into bite sized pieces, discarding the hard woody stems. Drizzle olive oil over kale and "massage" pieces to ensure all pieces are lightly coated. Spread pieces over two baking sheets lined with parchment paper. Bake for 10 minutes, rotating baking sheets from top to bottom after 5 minutes. The chips should be crisp and not yet brown on the edges. Enjoy as a chip or as a topping in your favorite salad. I never thought about putting kale chips on a salad. That’s a great idea! And thanks for the tips on getting them perfectly crunchy. I’ve had soggy chips before, but never experimented enough to figure out why some turned out soggy and some didn’t. Now I don’t have to worry about it! I’m so glad we got to meet this weekend. 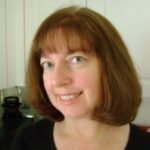 I’m looking forward to staying in touch online! Well now that is just plain fun! 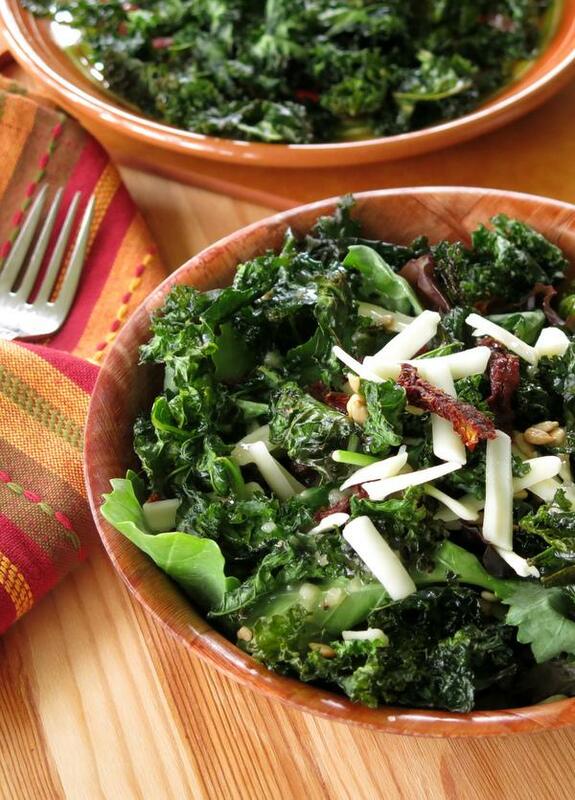 I love a great salad and the kale chip toppers are a tasty addition. I really need to make kale chips. I only half like kale on a normal basis. But kale chips I am ALWAYS on board with! I need to try this for my daughter. We got enough kale to feed an army in our CSA recently. Oooh, never thought to use them as a salad topper! What a clever idea to add a bit of crunch. 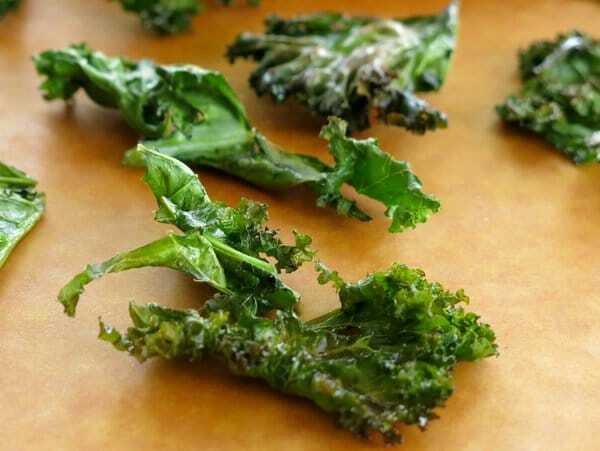 I’ve eaten kale chips for snack, but I never thought to use them in salad. What a great idea! My family and I have also had bad experiences with kale. I have always been too scared of it to cook it myself. I’m more of a spinach eater. However, in my family we LOVE chips! Maybe a little too much 😉 so maybe I could get away with kale chips! They looks great and I bet they did go wonderfully on a salad! I’ve had kale chips with nutritional yeast on them, and they’re delightfully salty. I tried making them once before and couldn’t get them to crisp up, but maybe I’ll try your method and see if it works. I really liked when I had them from a commercial manufacturer, but they were REALLY expensive. I hope they work out! Homemade chips are definitely cheaper!